Recommendation If you are looking for a Double Jogging Stroller that has safety features that will put your mind at ease while doing your morning or afternoon run then the InStep Double Swivel Stroller is the double jogging stroller for your family. It is durable, safe, and very convenient to use, at a price point that even young and budget-conscious families can afford. It is definitely a practical choice, and a good buy. Still not decide yet ? Make sure checking this out graco duoglider classic connect stroller then you won't regret. If you are looking for a Double Jogging Stroller that has safety features that will put your mind at ease while doing your morning or afternoon run then the InStep Double Swivel Stroller is the double jogging stroller for your family. It is durable, safe, and very convenient to use, at a price point that even young and budget-conscious families can afford. It is definitely a practical choice, and a good buy. If you are searching for a practical double jogging stroller for your family, then you might want to consider the InStep Safari Double Swivel Stroller. If you are searching for a practical double jogging stroller for your family, then you might want to consider the InStep Safari Double Swivel Stroller. This double jogging stroller does the job of most high-end double jogging strollers, complete with the safety, convenience and durability features you would like your children’s stroller to have – at a fraction of the price. It is easy to maneuver even in tight spaces, thanks to its swiveling mechanism. At the same time, it can be steady enough once the front tire is locked into position so that you will have no worries while running. The seats are padded and recline to the comfort of the children, plus it comes with adjustable canopies to protect the kids from the glare of the sun. It provides enough cup holders for parents and the babies, and the tray is removable too for when the children need to get out of the stroller. More importantly, it has safety mechanisms which include a dual-trigger folding mechanism, a tether strap, and a slip-resistant handle. It fold easily, and is compact enough to not occupy too much storage in your home or vehicle trunk. The InStep Safari Double Swivel Stroller comes with a dual-trigger folding mechanism that ensures that the stroller will not collapse or fold accidentally while the children are seated. It comes with pneumatic air tires, for both the front tire and the back tires. The front tires lock manually for easy adjustment from swiveling to locked position. It has a good breaking system when parked on tilted roads, plus it comes with a tether that can be ties to the parent’s hand just in case she accidentally lets go of her grip of the rubberized handle bars of the strollers. It also comes with five-point harnesses that are made of sturdy straps and are all padded. The seats are padded and they recline individually so it will not be an issue for the kids if one child may want to rest and the other would like to sit erect for sight-seeing. Though the seats are not fully reclinable it reclines to a level that will allow a comfortable snooze for the kids. It also comes with a canopy that can be adjusted independently of each other. There is also enough trays for the kids’ tumblers or bottles, as well as their snacks. It provides for a light ride, and is easy to push, thanks to the smooth tire mechanisms of the stroller. The lock for the front tire also helps in giving the parent the convenience as well as peace of mind while running. It also comes with an adjustable handle bar with a rubberized anti-slip grip that is easy to maneuver. It also comes with two cup holders – one for each parent, or if you are pushing it alone, you can have an extra bottle of water or a coffee cup in there. This may be as double stroller but it fits most public doors and even home doors. The tray is removable to facilitate the easy riding of a child who can already walk. It also folds easily, and the tires can be removed instantaneously for a more compact fit in the back of a mini-van or San UV or your storage space at home. It is easy to clean as well. The padded seats are all removable, and machine washable. The trays can come off so you can wash it easily should there be spills or if it needs disinfecting. It also has a bag basket underneath the seats, plus a small compartment in the handle bar to accommodate keys or small knick-knacks. Each seat can carry a child with a maximum of 50 pounds in weight. Comes in gender neutral colors, and is made in China. 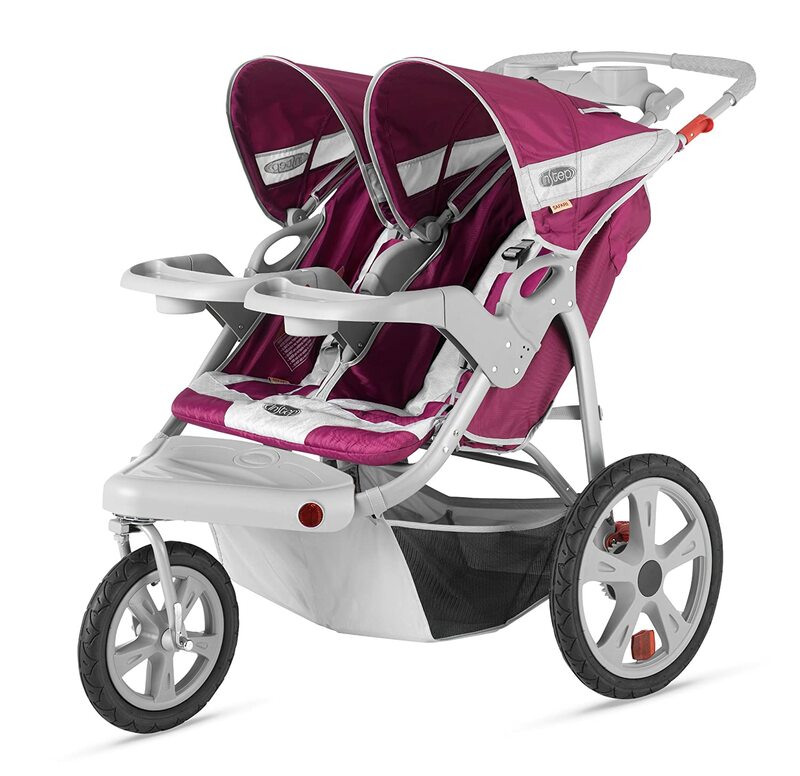 Great Price Point: The InStep Safari Double Swivel Stroller is practical double jogging stroller choice for families who would like to have a stroller that is at par with high-end brands, at a fraction of the price. Compared to similar types of stroller, this one is at the lower price end, but has an uncompromised quality. Smooth and Light Ride: This double jogging stroller provides a smooth and steady ride for a parent and more importantly for the children. It has enough safety features to put your mind at ease while jogging. It is very easy to maneuver, adjusts to the height of the parent, and at the same time easy to push. Cleaning is a Breeze: Since both the seats and the tray completely come off for washing, spills and blow-outs are completely manageable. Storage Compartments need to be improved: The tray that supposedly could hold a phone, cannot fit an iPhone, so you will have to put your stuff on the basket underneath the seats. The basket can accommodate a big diaper bag HOWEVER it has an obtrusive piece of metal stick that will block you from loading a big diaper bag underneath the stroller. Heavier and Bigger: It can fold up in a compact manner but compared to other similar strollers, this one is quite heavier and bigger in size when collapsed. The manufacturer tries to compensate with easy-to-remove tires, but we all know that when you have to use it again, putting back those tires will eat up time. Not Manufactured in the United States: Like most strollers in the market today, this stroller is not made in the USA, but rather in China. If that is a concern for you, then it is a disadvantage. If you are looking for a Double Jogging Stroller that has safety features that will put your mind at ease while doing your morning or afternoon run then the InStep Double Swivel Stroller is the double jogging stroller for your family. It is durable, safe, and very convenient to use, at a price point that even young and budget-conscious families can afford. It is definitely a practical choice, and a good buy. Still not decide yet ? Make sure checking this out graco duoglider classic connect stroller then you won’t regret.